Dulquer Salmaan, the son of megastar Mammooty who entered the tinsel town in 2012 with Srinath Rajendran's Second Show is gearing up to continue his journey in acting with a handful of projects in kitty. Even with only 8 movies in credit, Dulquer has already created his own space in the industry and also in the heart of movie lovers. His committed projects in 2014 include Samsaram Arogyathinu Hanikaram, Bangalore Days, Njan, Vikramadithyan and couple of untitled ventures with top directors. Samsaaram Aarogyathinu Haanikaram is a romantic movie creamed with humour directed y Balaji Mohan. Dulquer Salmaan and Nazriya Nazim will be seen in lead roles while Madhoo, Maniyanpilla Raju, Dinesh Nair, Chemban Vinod, Arjunan, John Vijay, Ramesh Thilak, Nandan Unni and Vinu Chakravarthy are also in the supporting cast. This movie will also mark the return of Madhubala after a gap. Samsaaram Aarogyathinu Haanikaram is produced by S Sashikanth and Varun Manian. Touted as a science fiction, the movie is simultaneously made in Tamil and Malayalam. 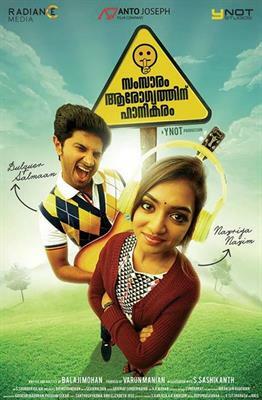 Nazriya plays the character role of Anjana, a doctor by profession while Dulquer Salmaan will be seen as a radio Jockey. For the lyrics of Santhosh Varma and Anu Elizabeth Jose, Ragavendra much known as Sean Roldan has set the tunes of the movie while Soundararajan stayed behind the camera as the DOP. This bilingual movie will reach theatres on 25th April 2014. 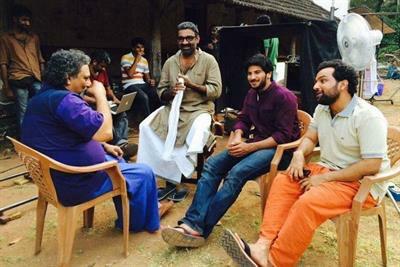 Dulquer Salmaan has completed yet another interesting movie helmed by debutant Anjali Menon. As the movie is packed with huge young cast, it is going to be time for movie enthusiasts to get entertained. Scripted by the director herself, the movie features Dulquer Salmaan, Fahadh Faasil,Nivin Pauly, Nithya Menen, Nazriya Nazim, Parvathi Menon and Isha Talwar in lead. Vijayaraghavan, Kalpana, Maniyanpilla Raju and Sajid Yahiya would give life to other prominent characters in 'Banglore Days'. This fun filled movie pools into the life of three youngsters who crossover from Kerala to Bangalore to keeping high dreams to explore the unknown. The music was composed by Gopi Sunder while the camera was safe in the hands of Sameer Thahir. Made with a budget of 8.5 Crores the movie lovers will be having a visual treat offered by the young brigades. Shot in Ernakulam, Banglore, Pondicherry, Chennai and Hyderabad, the movie is scheduled to reach theatres on 9th May 2014. Njan, based on the novel KTN Kottur Ezhuthum Jeevithavum written by TP Rajeev is Dulquer Salmaan's next outing in 2014. Directed by ace film maker Ranjith, it is said that Dulquer is playing the most challenging roles in his career. Dulquar would give life to an IT professional who is also a playwright and the actor. Joythi Krishna is the lead heroine while Anumol, Joy Mathew, Suresh Krishna, Chinnu Kuruvila, Shruthi, Hareesh Peradi, Saiju Kurup and Muthumani will be seen in prominent roles. All of them play Dulquer's friends, who are theatre activists. Ranjith has already done a movie titled 'Paleri Manikyam Oru Pathira Kolapathakathinte Kadha', which was based on the novel written by T P Raajeev. Vikramadithyan to be directed by Lal Jose with Dulquer Salmaan and Namitha Pramod in lead is expected to start rolling by mid 2014. It is also reported by mollywood hunk Unni Mukundan will be seen in an important role. Scripted by Dr Iqbal Kuttipuram,' Vikramadithyan' is said to be an action packed romantic movie to be creamed with all essence to keep the audience intact. The movie has nothing to do with the story of Vikramadithyan but would come along with an interesting storyline with the signature touch of Lal Jose.